An old-world Santa Claus stands watch over fluffy, white snowflakes and skiing snowmen in this year’s Holidays at the Higbee display at Horseshoe Cleveland. Pair that with the new “A Christmas Story” slot machine, the original 22-foot Higbee holiday tree and a park display in the casino’s welcome center and this year’s glimmering Winter Wonderland springs to life. Much of the sparkling decor of the previous three years will return but, this year, the casino will heighten the senses by creating a park-like scene throughout the casino. Adults over the age of 21 can stroll into the Welcome Center in the casino parking garage via Higbee Park, a tree-laden setting with park benches that enables guests to linger and enjoy the décor before heading into the casino. Continue into the casino’s second floor to visit the popular Old Man Winter and his glistening surroundings at Vintage 51 bar. Then take a ride down the escalators to the ground floor to take a spin on the “A Christmas Story” slot machines, which feature Ralphie and the gang evading a visit by the Bumpus Hounds and much more. The slot machine pays homage to Cleveland by showing clips of the movie in which Ralphie and family visit Santa at Higbee’s and prominently displaying photos of the original Christmas Story house in Tremont. The magic of the holidays at Higbee’s Department Store is reinvented as local interior design firm Room 2 Room illuminated the inside of the building with treasured favorites such as the 21 original trees from Higbee’s department store, 18 leg lamps and eight, garland-strung archways covering the first floor, just as they once did at Higbee’s during the holidays. 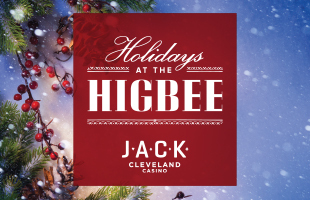 Numerous other surprises will await guests throughout the three floors of the casino, recreating the excitement and anticipation that can only be found at Holidays at the Higbee. Horseshoe will give away more than $200,000 in cash and prizes this holiday season with its Holidays at the Higbee promotion, which will run Nov. 28 – Dec. 26. All guests receive one free entry each promotional day but the more they play, the more entries they earn. The promotion will kick off on Nov. 28 with a $50,000 giveaway and will culminate in a $100,000 finale on Dec. 26. Prizes will also be given away throughout the month of the promotion. Horseshoe Cleveland’s buffet restaurant, The Spread, will serve holiday favorites all season long. Special holiday menus, prepared by Cleveland native Executive Chef Ed Michalski, will include traditional dishes and modern interpretations of holiday favorites. The buffet also will have extended hours on Thanksgiving, Christmas and New Year’s Eve. The Spread will be open 8 a.m. to 10 p.m. on Black Friday and News Year’s Day.